Just in case all those rainbow flags flying everywhere had obscured the Confederate flag still flying at the state capitol in South Carolina, Bree Newsome climbed the flag poll and took it down. Police were on top of the situation, helping Newsome and the flag down, and arresting her and James Tyson, her spotter, in short order. This was hardly the first project for the two activists from Charlotte. Newsome, a filmmaker and musician, had been working in voting rights campaigns in North Carolina. Tyson had been working in the environmental movement, and was also a veteran of Occupy Charlotte. The viral video shows politeness and cooperation everywhere, but the activists were arrested, booked, and released by the end of the day. Although their effort is unlikely to change a single vote in the state legislature, which is set to debate the flag next week, it did spur a wave of attention and support among flag opponents. Michael Moore tweeted support, promising to pay legal fees and fines. The NAACP issued a statement comparing their civil disobedience effort to those of Rosa Parks and Martin Luther King. And viral campaigns on numerous sites raised far more money than their legal defense is likely to cost. The attention was even greater. The flag was back up on the monument within the hour; there wouldn’t have been a shortage of Confederate flags anyway. A few dozen demonstrators supporting the flag showed up shortly after Newsome and Tyson departed, demonstrating on behalf of heritage–whatever that means. 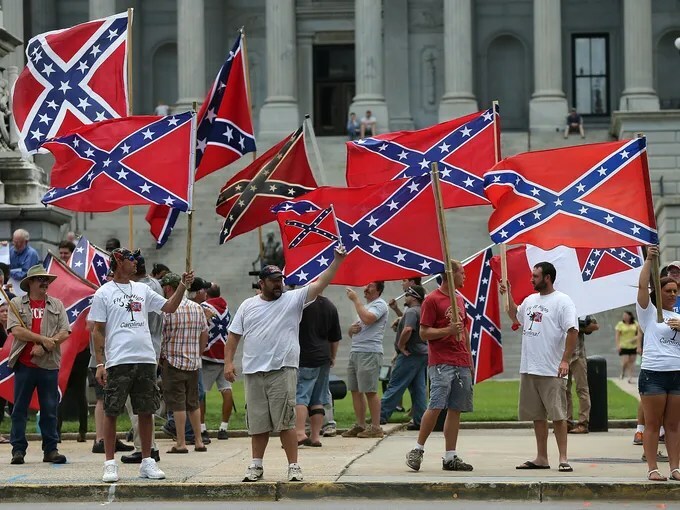 The pro-flag demonstrators proclaimed that they supported the honor of veterans, the traditions of the South, but most assuredly not racism or oppression. Oddly, just this rationalization, however twisted, represents the very serious influence of the anti-flag campaigners. Having your opponents adopt your rhetoric and concede your claims, even if not quite accurately, is a part of victory. Meanwhile Bree Newsome and James Tyson made sure the main story of the day was theirs, rather than that of their opponents, crowding the pro-flag demonstrators a little off to the corners of public attention. This entry was posted in Uncategorized and tagged Bree Newsome, Charlotte, civil disobedience, Columbia, Confederate flag, heritage, James Tyson, Martin Luther King, Michael Moore, NAACP, Occupy, race, Rosa Parks, South Carolina. Bookmark the permalink.